CLEAN CARFAX! SPORT PKG -inc: 18 AMG® twin 6-spoke aluminum wheels, P245/40R18 front & P265/35R18 rear all-season tires, black ash or burl walnut interior wood trim, sport suspension, 3-spoke multi-function sport steering wheel, black roof liner, sport bodystyling, PWR TILT/SLIDE PANORAMA SUNROOF -inc: 1-touch open/close, PREMIUM 1 PKG -inc: COMAND® system w/40GB hard drive navigation, enhanced voice control, Gracenote media database, HD Radio, 450-watt Harman Kardon Logic 7® surround sound system, heated & ventilated front seats, iPod/MP3 media interface in glovebox, pwr rear sunshade, rearview camera, SIRIUS satellite radio w/real-time traffic, Zagat survey restaurant guide, 6-GB MP3 Music Register hard drive, BURL WALNUT WOOD INTERIOR TRIM, ARCTIC WHITE, ALMOND/BLACK, LEATHER SEAT TRIM, Vehicle-speed-sensitive pwr rack & pinion steering, Variable-focus halogen headlamps w/projector low beams, Tire pressure monitoring system, Temporary spare tire w/steel wheel. This Mercedes-Benz E-Class has a powerful Gas V8 5.5L/333 engine powering this Automatic transmission. *These Packages Will Make Your Mercedes-Benz E-Class E 550 Sport The Envy of Your Friends *Single red rear foglamp, Selectable light-sensing headlamps, Rear wheel drive, Rear seat belts -inc: outboard emergency tensioning device, adaptive belt force limiter, outboard automatic height adjustment, Rain-sensing windshield wipers w/heated windshield washer reservoir, Pwr windows w/1-touch express down & up, Pwr tilt/slide glass sunroof -inc: sunshade, 1-touch express open/close, sunroof memory, Pwr heated signal mirrors -inc: mirror memory, auto-dimming driver mirror, Pwr door locks w/drive away locking, Programmable daytime running lamps w/auto override, PRESAFE® collision preparedness system, P245/40R18 front & P265/35R18 rear all-season performance tires, Outboard rear universal lower anchors & tethers for children (LATCH), Night security illumination, Multi-function display in instrument cluster -inc: trip computer, exterior temp gauge, digital speedometer, oil-level check, audio status, reminder & malfunction indicator, driver-programmable settings, trip meter, Mercedes-Benz Maintenance System Plus display, mbrace® -inc: stolen vehicle recovery, remote door unlock service, automatic alarm & collision notification, Leather-wrapped steering wheel -inc: audio & multi-function display controls, Leather-trimmed shift knob, Leather seat trim. *Visit Us Today *Stop by RBM of Atlanta located at 7640 Roswell Road, Atlanta, GA 30350 for a quick visit and a great vehicle!CLEAN CARFAX! SPORT PKG -inc: 18 AMG® twin 6-spoke aluminum wheels, P245/40R18 front & P265/35R18 rear all-season tires, black ash or burl walnut interior wood trim, sport suspension, 3-spoke multi-function sport steering wheel, black roof liner, sport bodystyling, PWR TILT/SLIDE PANORAMA SUNROOF -inc: 1-touch open/close, PREMIUM 1 PKG -inc: COMAND® system w/40GB hard drive navigation, enhanced voice control, Gracenote media database, HD Radio, 450-watt Harman Kardon Logic 7® surround sound system, heated & ventilated front seats, iPod/MP3 media interface in glovebox, pwr rear sunshade, rearview camera, SIRIUS satellite radio w/real-time traffic, Zagat survey restaurant guide, 6-GB MP3 Music Register hard drive, BURL WALNUT WOOD INTERIOR TRIM, ARCTIC WHITE, ALMOND/BLACK, LEATHER SEAT TRIM, Vehicle-speed-sensitive pwr rack & pinion steering, Variable-focus halogen headlamps w/projector low beams, Tire pressure monitoring system, Temporary spare tire w/steel wheel. This Mercedes-Benz E-Class has a powerful Gas V8 5.5L/333 engine powering this Automatic transmission. *These Packages Will Make Your Mercedes-Benz E-Class E 550 Sport The Envy of Your Friends *Single red rear foglamp, Selectable light-sensing headlamps, Rear wheel drive, Rear seat belts -inc: outboard emergency tensioning device, adaptive belt force limiter, outboard automatic height adjustment, Rain-sensing windshield wipers w/heated windshield washer reservoir, Pwr windows w/1-touch express down & up, Pwr tilt/slide glass sunroof -inc: sunshade, 1-touch express open/close, sunroof memory, Pwr heated signal mirrors -inc: mirror memory, auto-dimming driver mirror, Pwr door locks w/drive away locking, Programmable daytime running lamps w/auto override, PRESAFE® collision preparedness system, P245/40R18 front & P265/35R18 rear all-season performance tires, Outboard rear universal lower anchors & tethers for children (LATCH), Night security illumination, Multi-function display in instrument cluster -inc: trip computer, exterior temp gauge, digital speedometer, oil-level check, audio status, reminder & malfunction indicator, driver-programmable settings, trip meter, Mercedes-Benz Maintenance System Plus display, mbrace® -inc: stolen vehicle recovery, remote door unlock service, automatic alarm & collision notification, Leather-wrapped steering wheel -inc: audio & multi-function display controls, Leather-trimmed shift knob, Leather seat trim. *Visit Us Today *Stop by RBM of Atlanta located at 7640 Roswell Road, Atlanta, GA 30350 for a quick visit and a great vehicle! WHEELS: 17 TWIN 5-SPOKE ALLOY -inc: 7.5J x 17 ET 47 front and 8.5J x 17 ET 58 rear (STD), STEEL GRAY METALLIC, REAR TRUNK LID SPOILER, MULTIMEDIA PACKAGE -inc: 7 high resolution LCD color display, SiriusXM Traffic and Weather service, Gracenote media database w/album cover art, Voice Control, Rear View Camera, Radio: In-Dash Single DVD/CD Player, SD card slot, COMAND® System w/Hard-Drive Navigation, KEYLESS GO, BURL WALNUT WOOD TRIM, ASH, MB-TEX UPHOLSTERY, Window Grid Antenna, Wheels: 17 Twin 5-Spoke Alloy -inc: 7.5J x 17 ET 47 front and 8.5J x 17 ET 58 rear, Wheels w/Silver Accents. This Mercedes-Benz C-Class has a powerful Intercooled Turbo Premium Unleaded I-4 1.8 L/110 engine powering this Automatic transmission. *Experience a Fully-Loaded Mercedes-Benz C-Class C 250 Coupe *Trunk Rear Cargo Access, Trip computer, Transmission: 7-Speed Automatic 7G-TRONIC Plus -inc: touch shift, Tracker System, Tires: 225/45R17 Fr & 245/40R17 Rr All-Season, Tire Specific Low Tire Pressure Warning, Systems Monitor, Strut Front Suspension w/Coil Springs, Steel Spare Wheel, Sport Leather/Metal-Look Steering Wheel, Smart Device Integration, Single Stainless Steel Exhaust w/Chrome Tailpipe Finisher, Side Impact Beams, Send2Benz Selective Service Internet Access, Remote Releases -Inc: Power Cargo Access, Remote Keyless Entry w/Integrated Key Transmitter, 2 Door Curb/Courtesy, Illuminated Entry and Panic Button, Refrigerated/Cooled Box Located In The Glovebox, Driver And Passenger Door Bins, Redundant Digital Speedometer, Rear-Wheel Drive, Rear Fog Lamps. *Visit Us Today *Stop by RBM of Atlanta located at 7640 Roswell Road, Atlanta, GA 30350 for a quick visit and a great vehicle!WHEELS: 17 TWIN 5-SPOKE ALLOY -inc: 7.5J x 17 ET 47 front and 8.5J x 17 ET 58 rear (STD), STEEL GRAY METALLIC, REAR TRUNK LID SPOILER, MULTIMEDIA PACKAGE -inc: 7 high resolution LCD color display, SiriusXM Traffic and Weather service, Gracenote media database w/album cover art, Voice Control, Rear View Camera, Radio: In-Dash Single DVD/CD Player, SD card slot, COMAND® System w/Hard-Drive Navigation, KEYLESS GO, BURL WALNUT WOOD TRIM, ASH, MB-TEX UPHOLSTERY, Window Grid Antenna, Wheels: 17 Twin 5-Spoke Alloy -inc: 7.5J x 17 ET 47 front and 8.5J x 17 ET 58 rear, Wheels w/Silver Accents. This Mercedes-Benz C-Class has a powerful Intercooled Turbo Premium Unleaded I-4 1.8 L/110 engine powering this Automatic transmission. *Experience a Fully-Loaded Mercedes-Benz C-Class C 250 Coupe *Trunk Rear Cargo Access, Trip computer, Transmission: 7-Speed Automatic 7G-TRONIC Plus -inc: touch shift, Tracker System, Tires: 225/45R17 Fr & 245/40R17 Rr All-Season, Tire Specific Low Tire Pressure Warning, Systems Monitor, Strut Front Suspension w/Coil Springs, Steel Spare Wheel, Sport Leather/Metal-Look Steering Wheel, Smart Device Integration, Single Stainless Steel Exhaust w/Chrome Tailpipe Finisher, Side Impact Beams, Send2Benz Selective Service Internet Access, Remote Releases -Inc: Power Cargo Access, Remote Keyless Entry w/Integrated Key Transmitter, 2 Door Curb/Courtesy, Illuminated Entry and Panic Button, Refrigerated/Cooled Box Located In The Glovebox, Driver And Passenger Door Bins, Redundant Digital Speedometer, Rear-Wheel Drive, Rear Fog Lamps. *Visit Us Today *Stop by RBM of Atlanta located at 7640 Roswell Road, Atlanta, GA 30350 for a quick visit and a great vehicle! WOOD TRIM PKG -inc: wood & leather-wrapped steering wheel, gearshift paddles, wood & leather-wrapped shift knob, REAR DECK SPOILER, PREMIUM 2 PKG -inc: COMAND® system w/40GB hard drive navigation, enhanced voice control, HD Radio, 500-watt Harman Kardon Logic 7® surround sound system, heated & ventilated front seats, iPod/MP3 media interface in glovebox, airscarf ventilated headrests, rearview camera, SIRIUS satellite radio w/real-time traffic, Zagat survey restaurant guide, adaptive highbeam assist, bi-xenon headlamps w/active curve illumination, headlamp washing system, Keyless Go, LED daytime running lamps, LED front turn signals, 6-GB MP3 Music Register hard drive, PALLADIUM SILVER METALLIC, BURL WALNUT WOOD INTERIOR TRIM, BLACK SOFT TOP, ASH/DARK GREY, LEATHER SEAT TRIM, APPEARANCE PKG -inc: Agility Control sport suspenion, rubber-studded stainless steel pedals, black shift paddles, multi-contour front bucket seats, 4-wheel perforated disc brakes w/painted calipers, 18 x 8.5 front & 18 x 9.0 rear AMG® twin 5-spoke aluminum wheels, Vehicle-speed-sensitive pwr rack & pinion steering, Variable-focus halogen headlamps w/projector low beams. This Mercedes-Benz E-Class has a strong Gas V6 3.5L/213 engine powering this Automatic transmission. *These Packages Will Make Your Mercedes-Benz E-Class E 350 Cabriolet The Envy of Your Friends *SmartKey infrared remote -inc: trunk open, windows open/close, panic alarm, fuel filler door, selective unlock, Single red rear foglamp, Selectable light-sensing headlamps, Roll-over sensor, Rear wheel drive, Rear storage pass through, Rear seat belts -inc: outboard emergency tensioning device, adaptive belt force limiter, outboard automatic height adjustment, Rain-sensing windshield wipers, Pwr windows w/1-touch express down & up, Pwr retractable soft top, Pwr heated signal mirrors -inc: mirror memory, auto-dimming driver mirror, Pwr door locks w/drive away locking, Programmable daytime running lamps w/auto override, PRESAFE® collision preparedness system, P235/45R17 front & P255/40R17 rear all-season tires, Outboard rear universal lower anchors & tethers for children (LATCH), Night security illumination, Multi-function display in instrument cluster -inc: trip computer, exterior temp gauge, digital speedometer, oil-level check, audio status, reminder & malfunction indicator, driver-programmable settings, trip meter, Leather-wrapped steering wheel -inc: audio & multi-function display controls, Leather-trimmed shift knob. *Stop By Today *For a must-own Mercedes-Benz E-Class come see us at RBM of Atlanta, 7640 Roswell Road, Atlanta, GA 30350. Just minutes away!WOOD TRIM PKG -inc: wood & leather-wrapped steering wheel, gearshift paddles, wood & leather-wrapped shift knob, REAR DECK SPOILER, PREMIUM 2 PKG -inc: COMAND® system w/40GB hard drive navigation, enhanced voice control, HD Radio, 500-watt Harman Kardon Logic 7® surround sound system, heated & ventilated front seats, iPod/MP3 media interface in glovebox, airscarf ventilated headrests, rearview camera, SIRIUS satellite radio w/real-time traffic, Zagat survey restaurant guide, adaptive highbeam assist, bi-xenon headlamps w/active curve illumination, headlamp washing system, Keyless Go, LED daytime running lamps, LED front turn signals, 6-GB MP3 Music Register hard drive, PALLADIUM SILVER METALLIC, BURL WALNUT WOOD INTERIOR TRIM, BLACK SOFT TOP, ASH/DARK GREY, LEATHER SEAT TRIM, APPEARANCE PKG -inc: Agility Control sport suspenion, rubber-studded stainless steel pedals, black shift paddles, multi-contour front bucket seats, 4-wheel perforated disc brakes w/painted calipers, 18 x 8.5 front & 18 x 9.0 rear AMG® twin 5-spoke aluminum wheels, Vehicle-speed-sensitive pwr rack & pinion steering, Variable-focus halogen headlamps w/projector low beams. This Mercedes-Benz E-Class has a strong Gas V6 3.5L/213 engine powering this Automatic transmission. *These Packages Will Make Your Mercedes-Benz E-Class E 350 Cabriolet The Envy of Your Friends *SmartKey infrared remote -inc: trunk open, windows open/close, panic alarm, fuel filler door, selective unlock, Single red rear foglamp, Selectable light-sensing headlamps, Roll-over sensor, Rear wheel drive, Rear storage pass through, Rear seat belts -inc: outboard emergency tensioning device, adaptive belt force limiter, outboard automatic height adjustment, Rain-sensing windshield wipers, Pwr windows w/1-touch express down & up, Pwr retractable soft top, Pwr heated signal mirrors -inc: mirror memory, auto-dimming driver mirror, Pwr door locks w/drive away locking, Programmable daytime running lamps w/auto override, PRESAFE® collision preparedness system, P235/45R17 front & P255/40R17 rear all-season tires, Outboard rear universal lower anchors & tethers for children (LATCH), Night security illumination, Multi-function display in instrument cluster -inc: trip computer, exterior temp gauge, digital speedometer, oil-level check, audio status, reminder & malfunction indicator, driver-programmable settings, trip meter, Leather-wrapped steering wheel -inc: audio & multi-function display controls, Leather-trimmed shift knob. 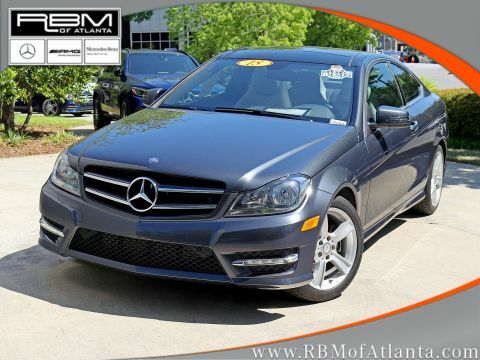 *Stop By Today *For a must-own Mercedes-Benz E-Class come see us at RBM of Atlanta, 7640 Roswell Road, Atlanta, GA 30350. Just minutes away! ONE OWNER, CLEAN CARFAX! SUPER BLACK, BEIGE, LEATHER SEAT TRIM -inc: wood-tone accents, [L93] CARPETED FRONT/REAR FLOOR MATS & TRUNK MAT, [B92] SPLASH GUARDS, Zone body construction, Xtronic continuously variable transmission (CVT), Vehicle security system, Vehicle immobilizer system, Vehicle dynamic control, Variable intermittent windshield wipers -inc: mist feature. This Nissan Altima has a powerful Gas I4 2.5L/152 engine powering this Variable transmission. *These Packages Will Make Your Nissan Altima 2.5 SL The Envy of Your Friends *UV reducing glass, Trunk lid trim, Traction control system (TCS), Tire pressure monitoring system (TPMS) -inc: 4-wheel tire pressure display, easy fill tire alert, Tilt & telescopic steering column, Side-door guard beams, Side cargo net, Shift interlock, Retained accessory pwr, Remote-controlled mirrors, Remote engine start, RearView Monitor, Rear window defroster w/timer, Rear assist grips, Pwr windows -inc: driver/front passenger 1-touch up/down & auto-reverse, Pwr tilt/sliding glass moonroof, Pwr remote trunk release w/cancel switch, Pwr remote front windows lowering, Pwr front vented/solid rear disc brakes, Pwr door locks w/auto-lock feature. *Stop By Today *Come in for a quick visit at RBM of Atlanta, 7640 Roswell Road, Atlanta, GA 30350 to claim your Nissan Altima!ONE OWNER, CLEAN CARFAX! SUPER BLACK, BEIGE, LEATHER SEAT TRIM -inc: wood-tone accents, [L93] CARPETED FRONT/REAR FLOOR MATS & TRUNK MAT, [B92] SPLASH GUARDS, Zone body construction, Xtronic continuously variable transmission (CVT), Vehicle security system, Vehicle immobilizer system, Vehicle dynamic control, Variable intermittent windshield wipers -inc: mist feature. This Nissan Altima has a powerful Gas I4 2.5L/152 engine powering this Variable transmission. *These Packages Will Make Your Nissan Altima 2.5 SL The Envy of Your Friends *UV reducing glass, Trunk lid trim, Traction control system (TCS), Tire pressure monitoring system (TPMS) -inc: 4-wheel tire pressure display, easy fill tire alert, Tilt & telescopic steering column, Side-door guard beams, Side cargo net, Shift interlock, Retained accessory pwr, Remote-controlled mirrors, Remote engine start, RearView Monitor, Rear window defroster w/timer, Rear assist grips, Pwr windows -inc: driver/front passenger 1-touch up/down & auto-reverse, Pwr tilt/sliding glass moonroof, Pwr remote trunk release w/cancel switch, Pwr remote front windows lowering, Pwr front vented/solid rear disc brakes, Pwr door locks w/auto-lock feature. 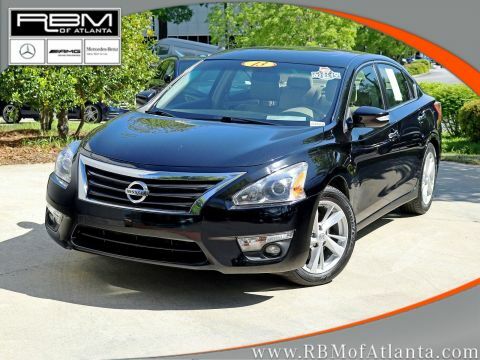 *Stop By Today *Come in for a quick visit at RBM of Atlanta, 7640 Roswell Road, Atlanta, GA 30350 to claim your Nissan Altima! ONE OWNER, CLEAN CARFAX! MAGNETIC GRAY METALLIC, ASH, LEATHER SEAT TRIM, Wood-grain style interior trim -inc: chrome door handles, Wood-grain shift knob, Whiplash-lessening front seats, Washer-linked variable intermittent windshield wipers, Vehicle stability control, Variable assist pwr rack & pinion steering, Traction control, Tire pressure monitor system. This Toyota Camry has a strong Gas V6 3.5L/211 engine powering this Automatic transmission. *These Packages Will Make Your Toyota Camry XLE The Envy of Your Friends *Smart stop technology, Smart key system -inc: remote keyless entry, trunk release, Side-impact door beams, Rearview camera, Rear window defogger w/timer, Pwr windows -inc: driver auto up/down, retained pwr, pinch protection, Pwr front ventilated/rear solid disc brakes -inc: brake assist, Pwr auto door locks w/anti-lockout feature, Push-button start, Projector beam auto on/off halogen headlamps, P215/55R17 all-season tires, Overhead console -inc: front map lights, sunglass holder, Navigation display AM/FM stereo w/CD player/MP3/WMA capability -inc: 6.1 touch screen w/vehicle info, aux audio jack, USB input w/iPod connectivity & control, HD Radio w/iTunes tagging, (6) speakers, Multi-information display -inc: twin tripmeters, outside temp display, fuel economy history, avg fuel economy, distance-to-empty, trip computer, Lockable illuminated glove box, Leather-wrapped tilt/telescoping steering wheel -inc: steering wheel audio controls, steering wheel Bluetooth® controls, Leather seat trim, LATCH child restraint system *Outboard rear seat positions only*, Internal trunk release handle, Integrated fog lamps. 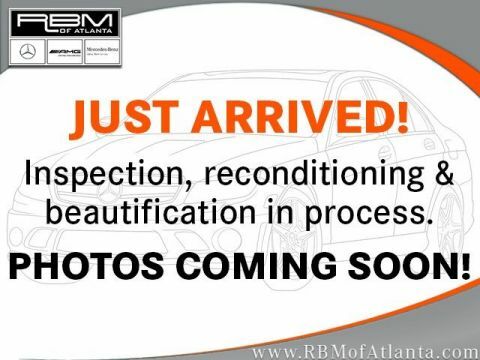 *Stop By Today *Test drive this must-see, must-drive, must-own beauty today at RBM of Atlanta, 7640 Roswell Road, Atlanta, GA 30350.ONE OWNER, CLEAN CARFAX! MAGNETIC GRAY METALLIC, ASH, LEATHER SEAT TRIM, Wood-grain style interior trim -inc: chrome door handles, Wood-grain shift knob, Whiplash-lessening front seats, Washer-linked variable intermittent windshield wipers, Vehicle stability control, Variable assist pwr rack & pinion steering, Traction control, Tire pressure monitor system. This Toyota Camry has a strong Gas V6 3.5L/211 engine powering this Automatic transmission. *These Packages Will Make Your Toyota Camry XLE The Envy of Your Friends *Smart stop technology, Smart key system -inc: remote keyless entry, trunk release, Side-impact door beams, Rearview camera, Rear window defogger w/timer, Pwr windows -inc: driver auto up/down, retained pwr, pinch protection, Pwr front ventilated/rear solid disc brakes -inc: brake assist, Pwr auto door locks w/anti-lockout feature, Push-button start, Projector beam auto on/off halogen headlamps, P215/55R17 all-season tires, Overhead console -inc: front map lights, sunglass holder, Navigation display AM/FM stereo w/CD player/MP3/WMA capability -inc: 6.1 touch screen w/vehicle info, aux audio jack, USB input w/iPod connectivity & control, HD Radio w/iTunes tagging, (6) speakers, Multi-information display -inc: twin tripmeters, outside temp display, fuel economy history, avg fuel economy, distance-to-empty, trip computer, Lockable illuminated glove box, Leather-wrapped tilt/telescoping steering wheel -inc: steering wheel audio controls, steering wheel Bluetooth® controls, Leather seat trim, LATCH child restraint system *Outboard rear seat positions only*, Internal trunk release handle, Integrated fog lamps. *Stop By Today *Test drive this must-see, must-drive, must-own beauty today at RBM of Atlanta, 7640 Roswell Road, Atlanta, GA 30350. ONE OWNER, CLEAN CARFAX! RUBBER MONSTER MATS (SET OF 4), BLACK UNI/BEIGE ROOF, BEIGE, V-TEX LEATHERETTE SEATING SURFACES, ALARM KIT, Window Grid Diversity Antenna, Wheels: 17 Turbine Alloy, Wheels w/Silver Accents, V-Tex leatherette seating surfaces, Variable Intermittent Wipers w/Heated Jets, Valet Function. This Volkswagen Beetle Convertible has a strong Intercooled Turbo Regular Unleaded I-4 1.8 L/110 engine powering this Automatic transmission. *Experience a Fully-Loaded Volkswagen Beetle Convertible 1.8T S *Trip computer, Transmission: 6-Speed Automatic, Transmission w/Driver Selectable Mode and Sequential Shift Control, Tires: 17 AS, Tailgate/Rear Door Lock Included w/Power Door Locks, Strut Front Suspension w/Coil Springs, Streaming Audio, Steel Spare Wheel, Single Stainless Steel Exhaust, Side Impact Beams, Seats w/Leatherette Back Material, Rigid Cargo Cover, Remote Keyless Entry w/Integrated Key Transmitter, Illuminated Entry and Panic Button, Redundant Digital Speedometer, Rear Cupholder, Radio: AM/FM 5 Touchscreen w/CD Player -inc: Composition Color, USB, aux-in, 8-speaker sound system and Bluetooth® connectivity, Radio w/Seek-Scan, MP3 Player, Clock, Speed Compensated Volume Control, Steering Wheel Controls, Radio Data System and External Memory Control, Power Rear Windows, Power Fuel Flap Locking Type, Power Door Locks w/Autolock Feature. 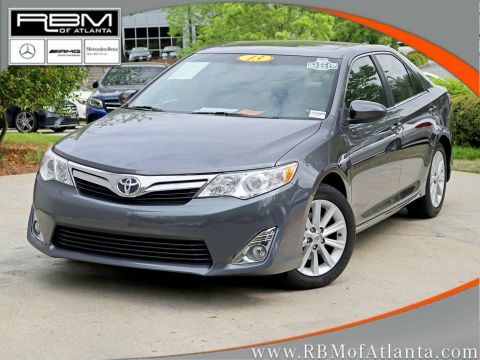 *Visit Us Today *Test drive this must-see, must-drive, must-own beauty today at RBM of Atlanta, 7640 Roswell Road, Atlanta, GA 30350.ONE OWNER, CLEAN CARFAX! RUBBER MONSTER MATS (SET OF 4), BLACK UNI/BEIGE ROOF, BEIGE, V-TEX LEATHERETTE SEATING SURFACES, ALARM KIT, Window Grid Diversity Antenna, Wheels: 17 Turbine Alloy, Wheels w/Silver Accents, V-Tex leatherette seating surfaces, Variable Intermittent Wipers w/Heated Jets, Valet Function. This Volkswagen Beetle Convertible has a strong Intercooled Turbo Regular Unleaded I-4 1.8 L/110 engine powering this Automatic transmission. 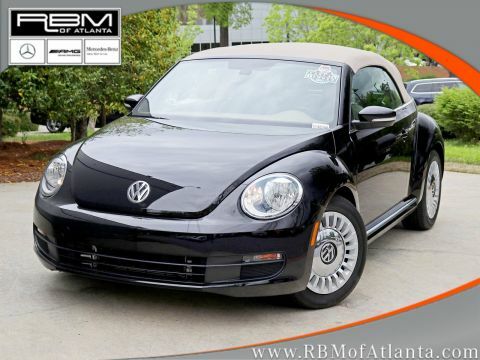 *Experience a Fully-Loaded Volkswagen Beetle Convertible 1.8T S *Trip computer, Transmission: 6-Speed Automatic, Transmission w/Driver Selectable Mode and Sequential Shift Control, Tires: 17 AS, Tailgate/Rear Door Lock Included w/Power Door Locks, Strut Front Suspension w/Coil Springs, Streaming Audio, Steel Spare Wheel, Single Stainless Steel Exhaust, Side Impact Beams, Seats w/Leatherette Back Material, Rigid Cargo Cover, Remote Keyless Entry w/Integrated Key Transmitter, Illuminated Entry and Panic Button, Redundant Digital Speedometer, Rear Cupholder, Radio: AM/FM 5 Touchscreen w/CD Player -inc: Composition Color, USB, aux-in, 8-speaker sound system and Bluetooth® connectivity, Radio w/Seek-Scan, MP3 Player, Clock, Speed Compensated Volume Control, Steering Wheel Controls, Radio Data System and External Memory Control, Power Rear Windows, Power Fuel Flap Locking Type, Power Door Locks w/Autolock Feature. *Visit Us Today *Test drive this must-see, must-drive, must-own beauty today at RBM of Atlanta, 7640 Roswell Road, Atlanta, GA 30350. ONE OWNER, CLEAN CARFAX! PREMIUM PLUS PKG -inc: lighting pkg, auto-dimming interior mirror w/compass, auto-dimming heated exterior mirrors, convenience pkg, memory function for driver seat, heated front seats, MOONLIGHT BLUE PEARL, FRONT GRILLE FILLER PANEL, FINE GRAIN ASH NATURAL INTERIOR WOOD TRIM, CHESTNUT BROWN, LEATHER SEATING SURFACES, BANG & OLUFSEN PREMIUM SOUND SYSTEM, AUDI MMI NAVIGATION PLUS PKG -inc: single-CD/DVD player & HD Radio, color driver information system, HDD navigation w/voice control, MMI high control panel, parking system plus w/rearview camera, Audi connect w/online services, AUDI ADVANCED KEY, Variable-intermittent rain sensing wipers, Trunk storage pkg. This Audi ALLROAD has a strong Turbocharged Gas I4 2.0L/121 engine powering this Automatic transmission. *These Packages Will Make Your Audi ALLROAD Premium Plus The Envy of Your Friends *Tilt & telescoping manually adjustable steering column, Space saving spare tire, SIRIUS satellite radio, Red ambient LED lighting in overhead console, Rear window defogger, Rear door child safety locks, quattro permanent all-wheel drive system, Pwr windows w/one-touch up & down, pinch protection, Pwr vented front & solid rear disc brakes, Pwr central locking system, P245/40R18 all-season tires, Next generation front airbags w/dual-threshold deployment & passenger sensor, Lockable glovebox, LED tail lamps, LED daytime running lamps, Leather wrapped shift knob, Leather seating surfaces, LATCH provisions in rear seats, Keyless entry, Independent trapezoidal link rear suspension w/rigid subframe mount & anti-roll bar. 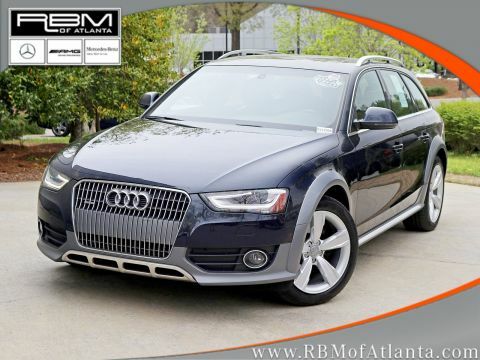 *Stop By Today *Test drive this must-see, must-drive, must-own beauty today at RBM of Atlanta, 7640 Roswell Road, Atlanta, GA 30350.ONE OWNER, CLEAN CARFAX! PREMIUM PLUS PKG -inc: lighting pkg, auto-dimming interior mirror w/compass, auto-dimming heated exterior mirrors, convenience pkg, memory function for driver seat, heated front seats, MOONLIGHT BLUE PEARL, FRONT GRILLE FILLER PANEL, FINE GRAIN ASH NATURAL INTERIOR WOOD TRIM, CHESTNUT BROWN, LEATHER SEATING SURFACES, BANG & OLUFSEN PREMIUM SOUND SYSTEM, AUDI MMI NAVIGATION PLUS PKG -inc: single-CD/DVD player & HD Radio, color driver information system, HDD navigation w/voice control, MMI high control panel, parking system plus w/rearview camera, Audi connect w/online services, AUDI ADVANCED KEY, Variable-intermittent rain sensing wipers, Trunk storage pkg. This Audi ALLROAD has a strong Turbocharged Gas I4 2.0L/121 engine powering this Automatic transmission. *These Packages Will Make Your Audi ALLROAD Premium Plus The Envy of Your Friends *Tilt & telescoping manually adjustable steering column, Space saving spare tire, SIRIUS satellite radio, Red ambient LED lighting in overhead console, Rear window defogger, Rear door child safety locks, quattro permanent all-wheel drive system, Pwr windows w/one-touch up & down, pinch protection, Pwr vented front & solid rear disc brakes, Pwr central locking system, P245/40R18 all-season tires, Next generation front airbags w/dual-threshold deployment & passenger sensor, Lockable glovebox, LED tail lamps, LED daytime running lamps, Leather wrapped shift knob, Leather seating surfaces, LATCH provisions in rear seats, Keyless entry, Independent trapezoidal link rear suspension w/rigid subframe mount & anti-roll bar. *Stop By Today *Test drive this must-see, must-drive, must-own beauty today at RBM of Atlanta, 7640 Roswell Road, Atlanta, GA 30350. CLEAN CARFAX! XM satellite, Warning lights -inc: low-fuel, low-oil pressure, door/tailgate open, passenger airbags status, vehicle stability assist, Vehicle Stability Assist (VSA) w/traction control, Variable Torque Management (VTM-4) 4-wheel drive system -inc: manual push-button locking rear differential, Variable pwr rack & pinion steering, Variable intermittent windshield wipers, Variable Cylinder Management (VCM), Upper & lower front row seatback pockets, Unit-body construction, Tri-zone automatic air conditioning -inc: humidity control, air-filtration system. This Honda Pilot has a strong Gas V6 3.5L/212 engine powering this Automatic transmission. *Experience a Fully-Loaded Honda Pilot Touring *Tire pressure monitoring system -inc: location indicators , pressure indicators, Tilt & telescoping steering column, Sliding sunvisor extensions, Side-impact door beams, Side curtain airbags on all rows w/rollover sensor, Security system, Roof rails, Remote Keyless Entry, Remote fuel filler door release, Rear window defroster w/timer, Rear seat heater ducts, Rear privacy glass, Rear hidden storage compartment, Pwr windows w/dual front auto-up/down, Pwr ventilated front/solid rear disc brakes, Pwr tailgate w/lift-up glass hatch, Pwr door & tailgate locks, Passenger-side 3rd row lower child seat anchors & tethers for children (LATCH), P235/60R18 all-season tires, Multi-reflector halogen headlights -inc: auto-on/off headlights. *Visit Us Today *Come in for a quick visit at RBM of Atlanta, 7640 Roswell Road, Atlanta, GA 30350 to claim your 2012 Honda Pilot Touring!CLEAN CARFAX! XM satellite, Warning lights -inc: low-fuel, low-oil pressure, door/tailgate open, passenger airbags status, vehicle stability assist, Vehicle Stability Assist (VSA) w/traction control, Variable Torque Management (VTM-4) 4-wheel drive system -inc: manual push-button locking rear differential, Variable pwr rack & pinion steering, Variable intermittent windshield wipers, Variable Cylinder Management (VCM), Upper & lower front row seatback pockets, Unit-body construction, Tri-zone automatic air conditioning -inc: humidity control, air-filtration system. This Honda Pilot has a strong Gas V6 3.5L/212 engine powering this Automatic transmission. *Experience a Fully-Loaded Honda Pilot Touring *Tire pressure monitoring system -inc: location indicators , pressure indicators, Tilt & telescoping steering column, Sliding sunvisor extensions, Side-impact door beams, Side curtain airbags on all rows w/rollover sensor, Security system, Roof rails, Remote Keyless Entry, Remote fuel filler door release, Rear window defroster w/timer, Rear seat heater ducts, Rear privacy glass, Rear hidden storage compartment, Pwr windows w/dual front auto-up/down, Pwr ventilated front/solid rear disc brakes, Pwr tailgate w/lift-up glass hatch, Pwr door & tailgate locks, Passenger-side 3rd row lower child seat anchors & tethers for children (LATCH), P235/60R18 all-season tires, Multi-reflector halogen headlights -inc: auto-on/off headlights. *Visit Us Today *Come in for a quick visit at RBM of Atlanta, 7640 Roswell Road, Atlanta, GA 30350 to claim your 2012 Honda Pilot Touring!